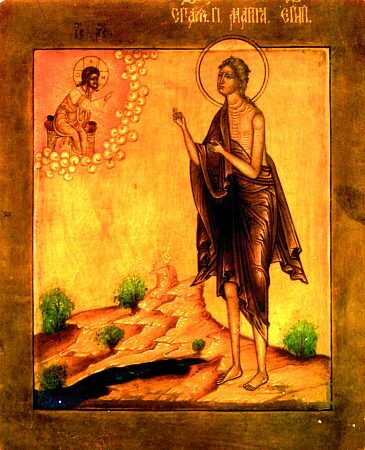 The Life of the Monastic Mary of Egypt: At a certain Palestinian monastery on the outskirts of Caesarea there lived a saintly monk, Zosima. Having dwelt at the monastery since his childhood, he asceticised at it until he reached age 53, when he was disturbed by the thought: "Is there to be found in all the furthermost wilderness – some holy person surpassing me in spiritual sobriety and deeds?" Just hardly had he thought this, when an Angel of the Lord appeared to him and said: "Thou, Zosima, by human standards hath asceticised not badly, but of mankind there is no one righteous (Rom. 3: 10). So that thou canst realise, how many there are of others and of higher forms of salvation, come out from this monastery, like Abraham from the house of his father (Gen. 12: 1), and go to the monastery situated by the Jordan". Abba Zosima immediately left the monastery and following behind the Angel he went to the Jordan monastery and settled in it. Here he beheld elders, truly radiant in their efforts. And Abba Zosima began to imitate the holy monks in spiritual activity. Thus passed much time, and the holy Forty-Day Lent approached. At the monastery there existed a custom, on account of which also God had led the Monk Zosima thither. On the First Sunday (i.e. Forgiveness Sunday) starting the Great Lent the hegumen served the Divine-liturgy, all communed the All-Pure Body and Blood of Christ, and they partook afterwards of a small repast and then gathered again in church. Having made prayer and a due number of poklon-prostrations, the elders, having asked forgiveness one of another, took blessing from the hegumen and during the common singing of the Psalm "The Lord is my Light and my Saviour: whom shalt I fear? The Lord is Defender of my life: from what shalt I be afraid?" (Ps. 26 : 1), they opened the monastery gate and went off into the wilderness. Each of them took with him a modest amount of food, such as needed it, while some however took nothing into the wilderness and fed on roots. The monks went about beyond the Jordan and spread out as far as possible, so that no one might see, how anyone fasted or asceticised. When Great Lent drew to a close, the monks returned to the monastery on Palm Sunday with the fruit of their labour (Rom. 6: 21-22), having tested out their own conscience (1 Pet. 3: 16). And as regards this, no one asked anything, how anyone had toiled or made their effort. And this year Abba Zosima also, in the monastery custom, went about beyond Jordan. He wanted to go deep into the wilderness, so as to find there any saints and great elders, both saving themselves there and praying for the world. He went on into the wilderness for 20 days and then, when he sang the Psalms of the 6th Hour and made the usual prayers, suddenly on the right side from him there appeared as it were the shadow of an human form. He took fright, thinking that it might be a demonic apparition, but then having made over himself the Sign of the Cross, he put aside the fear and finishing his prayer, he turned towards the side of the shadow and saw going through the wilderness a bare human form, the body of which was black from the blazing sunlight, and the faded short hair was whitened, like a sheep's fleece. Abba Zosima rejoiced, since for all these days he had not seen any living thing, and immediately he turned towards his right side. But just only as the naked wilderness-dweller perceived Zosima approaching, it immediately attempted to flee from him. Abba Zosima, forgetting his aches of age and fatigue, quickened his pace. But soon seeing the impossibility of gaining the upper hand he halted and began tearfully to implore the departing ascetic: "Why dost thou, saving thyself in this wilderness, flee from me, a sinful elder? Approach me, though I be incapable and unworthy, and grant me thine holy prayer and blessing, for the sake of the Lord, Who disdained no one ever". The stranger, without turning, cried out to him: "Excuse me, Abba Zosima, but I cannot turn about and show my face to thee: for I am a woman, and as thou wouldst see, there is upon me no sort of garb for the covering of bodily bareness. But if thou wouldst to pray for me, a great and woesome sinner, throw thine own cloak to cover me, and then I can approach thee for blessing". "She would not know me by name, save that through holiness and unknown deeds she hath acquired the gift of perspicacity from the Lord", – perceived Abba Zosima, and he proceeded to fulfill that asked of him. Covered by the cloak, the ascetic turned to Zosima: "Why thinkest thou, Abba Zosima, to speak with me, a woman sinful and unwise? What is it that thou dost wish to learn from me, and in sparing no strength thou didst exert such efforts?" He however, having bent down upon his knees, asked blessing of her. At this point she likewise bent down before him, and for a long time they both each implored the other: "Bless". Finally the woman ascetic said: "Abba Zosima, it becometh thee to bless and to make the prayer, since thou art honoured with the dignity of presbyter and for many years, standing before the altar of Christ, thou hast offered up to the Lord the Holy Gifts". These words frightened the Monk Zosima all the more. With a deep gasp he answered her: "O spiritual mother! Clearly of us two thou art the far closer to God and mortified for this world. Thou hast known me by name and called me priest, never before having seen me. It becometh thee therefore to bless me, for the sake of the Lord". Yielding finally to the obstinance of Zosima, the Nun said: "Blessed is God, Who willeth the salvation of all mankind". Abba Zosima answered: "Amen", and they rose up from the ground. The woman ascetic again said to the elder: "Why hast thou come, father, to me a sinner, bereft of every virtue? Apparently, moreover, the grace of the Holy Spirit hath guided thee to do me one service, needful for my soul. But tell me first, Abba, how now live the Christians, how now thrive and prosper the Saints of God's Church?" Abba Zosima answered her: "By your holy prayers God hath granted the Church and us all an effective peace. But thou who hast hearkened to the entreaty of an unworthy elder, my mother, to have prayed on account of God for all the world and for me a sinner, – let not this wilderness meeting be for me to no avail". The holy ascetic answered: "It more becometh thee, Abba Zosima, having priestly rank, to pray for me and for all. For this also was the dignity bestown thee. Moreover, all thine request bid of me gladly wilt be fulfilled on account of obedience to Truth and from purity of heart". Having spoken thus, the saint turned herself towards the East, and having lifted up her eyes and raising up her hands to Heaven, she began to prayer in a whisper. The elder beheld, how she stood in the air a cubit off the ground. Seeing this wondrous vision, Zosima threw himself down prostrate, praying fervently and not daring to say anything except "Lord, have mercy!" The thought entered his soul – a premonition whether this might lead him into temptation? The woman ascetic, having turned round, lifted him from the ground and said: "Why do ponderings so trouble thee, Abba Zosima? I am no apparition. I – am a woman sinful and unworthy, though also guarded by holy Baptism". Having said this, she signed herself with the Sign of the Cross. Seeing and hearing this, the elder fell with tears at the feet of the woman ascetic: "I beseech thee by Christ our God, conceal not from me thine ascetic life, but bespeak it all, so that it be made clear for God's majesty. Wherefore I do believe by the Lord my God, by Whom thou also dost live, that for this I was sent into the wilderness, so that all thine ascetic deeds be made manifest for the world". And the holy ascetic answered: "It distresses me, father, to relate to thee the shamelessness of my deeds. Whereof thou mightest then flee from me, averting the eyes and ears, as do they that flee the poisonous viper. But I shall tell thee everything, father, being silent about nothing of my sins, thou however I exhort thee, cease not to pray for me a sinner, that I be vested in boldness for the Day of Judgement. I was born in Egypt and my parents being yet alive, and I being a twelve year old girl, I left them and went to Alexandria. There I lost my chastity and gave myself over to unrestrained and insatiable fornication. For more than seventeen years I indulged licentiously and I did it all gratis. That I did not take money was not because I was rich. I lived in poverty and worked at a spinning-wheel. I thought, that all the meaning of life consisted in satisfying fleshly lust. Living such a life, I one time saw a crowd of people, from Libya and Egypt heading towards the sea, so as to sail to Jerusalem for the feast of the Exaltation of the Holy Cross. I too wanted to sail with them. But not because of Jerusalem and not because of the feast, but – simply, father, – because there would be more people with whom to indulge in depravity. And so I embarked on the ship. Now, father, believe me, I am very amazed, that the sea tolerated my wantonness and fornication, that the earth did not open up its mouth and take me down alive into hell, so enticed and lost a soul... But evidently, God desired my repentance, not the death of the sinner, with long-suffering patience awaiting my conversion. Thus I arrived in Jerusalem and all the days prior to the feast were just like on the ship, spent in obscene matters. When the holy feast of the Exaltation of the Venerable Cross of the Lord arrived, I went about as before, for tempting the souls of youths to sin. Having seen, that everyone very early was heading to the church, in which was situated the Life-Creating Wood, I went along with everyone and went into the church portico area. When the hour of the Holy Elevation drew nigh, I wanted to enter into the church with all the people. With great effort shoving myself towards the doors, I the wretch that I was, attempted to squeeze inside. But although I stepped up to the threshold, it was as though some force of God held me back, not allowing me to enter, and it threw me far off from the doors, whilst amidst this all the people went in without hindrance. I thought that, perhaps, it was through womanly weakness that I was not able to work my way into the crowd, and again I attempted to elbow aside people and shove myself to the doors. However hard I tried – I could not enter in. Just only as my feet but touched the church threshold, I was stopped. The church admitted everyone else, no one else was prevented entering, while only I the wretch was not allowed in. Thus it went for three or four times. My strength was exhausted. I went off and stood in a corner of the church portico. Here I came to sense, that it was my sins that prevented me to see the Life-Creating Wood, the grace of the Lord then touched my heart, I wept bitterly and in repentance I began to beat at myself upon the bosom. Lifting up to the Lord groans from the depths of my heart, I caught sight before me of an icon of the MostHoly Mother of God and I turned to it with the prayer: "O Lady Virgin, having given birth in the flesh to God the Word! I know, that I am unworthy to look upon Thine icon. It would be mete for me, an hateful prodigal, to be cast off from Thine purity and be for Thee an abomination, but I know also this, it was for this also that God became Man, in order to call sinners to repentance. Help me, O All-Pure One, that it be permitted me to enter into the church. Forbid me not to behold the Wood, upon which in the flesh the Lord wast crucified, shedding His innocent Blood also for me a sinner, to deliver me from sin. Do Thou command, O Lady, that the doors of the Holy Veneration of the Cross be opened to me. Be Thou for me the ardent Guide to He born of Thee. I promise Thee from this moment no more yet to defile myself with any sort of fleshly defilement, but just as soon as I but see the Wood of the Cross of Thy Son, I shalt immediately cut myself off from the world, and go whither Thou as Guide shalt guide me". And when I had prayed thus, I sensed suddenly, that my prayer had been heard. In humbleness of faith, trusting upon the Compassionate Mother of God, I again joined in with those entering into the church, and no one thrust me back or prevented me from entering. I went on in fear and trembling, lest I not reach it to the doors nor be vouchsafed to behold the Life-Creating Cross of the Lord. "O our Beloved Lady Mother of God! Thou hast not rejected my prayer as unworthy. Glory be to God, accepting through Thee the repentance of sinners. It has become time for me to fulfill the promise, in which Thou wert the Guide. Wherefore now, O Lady, guide me on the pathway of repentance". And herewith, not even having ended my prayer, I heard a voice, as though speaking from afar: "If thou pass over beyond Jordan, there wilt thou find the blessed respite". I immediately believed, that this voice was on my account, and with weeping I cried out to the Mother of God: "Mistress Lady, forsake me not, defiled sinner that I be, but help me", – and immediately I went from the church portico and proceeded along. A certain man gave me three coins of money. With them I bought myself three loaves of bread and from the merchant I learned the way to the Jordan. In setting off I went into the church of Saint John the Baptist near the Jordan. Having made poklon-prostration before everything in the church, I immediately went down to the Jordan and washed my face and hands with its water. Then in this same temple of Saint John the Forerunner I communed the Life-Creating Mysteries of Christ, I ate half of one of my loaves of bread, drank from the holy Jordan its water and slept there the night on the ground at the church. In the morning I found not far off a small craft, and I journeyed on it across the river to the opposite shore, and again I prayed my Guide, that She would guide me as it might please Her. And forthwith I came into this wilderness". Abba Zosima asked the Nun: "How many years is it, my mother, since he time when thou settled into this wilderness?" – "I think, – answered she, – 47 years have elapsed, since I came from the Holy City". Abba Zosima again asked: "What hast thou or what is it thou findest here as food, my mother?" And she answered: "I had with me two and an half loaves of bread when I traversed the Jordan, gradually they dried out and hardened, and eating little by little, for many years I ate from them". Again Abba Zosima asked: "Is it possible thou hast survived for so many years without sickness? And received thou no sort of temptations from unexpected suggestions and enticements?" – "Believe me, Abba Zosima, – answered the Nun, – I spent 17 years in this wilderness, literally like with wild beasts I struggled with my thoughts... When I began to eat bread, immediately the thought occurred about the meat and fish, towards which I was so attracted to in Egypt. I desired also the wine, since I drank much of it when I was in the world. Here indeed, not having often plain water and food, I fiercely suffered from thirst and hunger. I endured even more powerful woes: the desire seized upon me for lewd songs, I seemed to hear them, disturbing my heart and my hearing. Weeping and striking myself on the breast, I remembered then the promises I had given, going into the wilderness, given in front of the icon of the MostHoly Mother of God, my Guide, and I cried, imploring that the thoughts tearing at my soul be driven away. When repentance was perfected in the measure of prayer and weeping, I beheld from me a radiant Light, and then in place of my tempest a great quiet ensued. The prodigal thoughts, pardon, Abba, how shall I confess to thee? The fire of passion burned within my heart and burned all over me, exciting lust. At the appearance of the accursed thoughts I threw myself down on the ground and literally I saw, that before me would stand the MostHoly Guide Herself and She would judge me, for transgressing my given vows. Thus I did not get up, laying face downwards day and night upon the ground, until repentance was made and that blessed Light encircled me, dispelling the evil disturbances and thoughts. Thus I lived in this wilderness for the first seventeen years. Darkness after darkness, misery after misery stood about me, a sinner. But from that time until now the Mother of God, my Helper, guides me in everything". Abba Zosima again inquired: "How is it for thee that there is needed neither food, nor apparel?" She answered: "My bread ended, as I said, in those seventeen years. After that I began to eat roots and that which one is able to find in the wilderness. The clothing, which was upon me when I crossed over the Jordan, long ago shredded and fell apart, and I had then much to endure and to suffer both from the Summer heat, when the blazing heat fell upon me, and from the Winter, when I shivered from the cold. How many a time I fell down upon the earth, as though dead. How many a time in immeasurable struggle I dwelt with various misfortunes, woes and temptations. But from that time until the present day the power of God in unknown and manifold ways has watched over my sinful soul and humble body. I was fed and covered by the utterance of God, comprising all (Deut. 8: 3), since it is not by bread alone that man doth live, but by every utterance of God (Mt. 4: 4, Lk. 4: 4), and not having the protection of rocks to clothe themself in (Job 24: 8), if they do put off from themselves the garb of sin (Col. 3: 9). When I remembered, from what evil and from what sins the Lord delivered me, I found within this to be food inexhaustible". When Abba Zosima heard, that the holy ascetic spoke from memory from the Holy Scripture – from the Books of Moses and Job and from the Psalms of David, – he then asked the Nun: "Where, my mother, hast thou learned the Psalms and other Books?" She smiled at hearing this question, and answered thusly: "Believe me, O man of God, I have seen no one human, besides thee, from the time when I crossed over the Jordan. I was never earlier schooled in books, nor hearkened to church singing, nor Divine studies. Perhaps it is that the Word of God Himself, the Living and All-Creating, doth teach man everything intelligible (Col. 3: 16; 2 Pet. 1: 21; 1 Thes. 2: 13). However, enough still, I have confessed to thee all my life, but the point with which I began I also end on: I charge thee by the Incarnation of God the Word – holy Abba, pray for me, a great sinner. And I charge thee furthermore by the Saviour, our Lord Jesus Christ – that everything, which thou hast heard from me, be not told to anyone until such time, when God shalt take me from the earth. And do thou fulfill this also, which I herewith tell thee. A year's time in future, during the Great Lent, come not across the Jordan, as bids your monastery's custom". Again Abba Zosima was amazed, that the practice of his monastery was known to the holy woman ascetic, although in front of her he had not mentioned nor said anything about this. "Remain, Abba, – continued the Nun, – at the monastery. Moreover, if thou intendest to exit the monastery, thou wilt not be able to... And when there ensues holy Great Thursday with the Sacramental-mystery of the Last Supper of the Lord, place in an holy vessel the Life-Creating Body and Blood of Christ our God, and bring it to me. Await me on this side of the Jordan, at the edge of the wilderness, so that I in coming may commune the Holy Mysteries. And to Abba John, the hegumen of your monastery community, say thus: attend to thyself and thine flock (Acts 20: 23; 1 Tim. 4: 16). I desire, however, that thou not say this to him now, but when the Lord shalt indicate". Having spoken thus and having asked once more his prayer, the Nun turned and departed into the depths of the wilderness. A whole year the elder Zosima dwelt in silence, not daring by the Lord to reveal about the appearance to him, and he prayed diligently, that the Lord would grant him once more to see the holy ascetic. When again there ensued the first week of holy Great Lent, the Monk Zosima because of sickness was obliged to remain at the monastery. Then he remembered the prophetic words of the Nun, that he would not be able to exit the monastery. After the passing of several days the Monk Zosima was healed from his infirmity, but he remained the whole time until Passion Week at the monastery. The day of the remembrance of the Last Supper came nigh. And then Abba Zosima fulfilled what was commanded of him – in late evening he emerged from the monastery towards the Jordan and sat at the riverbank in expectation. The saint seemed tardy, and Abba Zosima prayed God, that He would not deprive him of the meeting with the woman ascetic. Finally the Nun came and stood at the far side of the river. Rejoicing, the Monk Zosima got up and glorified God. But the thought then came to him: how could she get across the Jordan without a boat? But the Nun, with the Sign of the Cross crossing over the Jordan, quickly made her way over the water. When the elder wanted to make prostration before her, she forbade him, crying out from amidst the river: "What art thou doing, Abba? Thou art a priest – bearing the great Mysteries of God". Having traversed the river, the Nun said to Abba Zosima: "Bless me, father". He however answered her with trembling, astonished at the wondrous vision: "Truly God is not false, in promising to liken unto Him all that are cleansed, howsoever this be possible with the dead. Glory to Thee, O Christ our God, having shown me through Thine holy servant, how far I stand from the measure of perfection". After this the Nun asked him to recite both the "I believe" of the Creed and the "Our Father". At the finish of the prayers, and having communed the Awesome Sacred Mysteries of Christ, she raised her hands towards the heavens and she pronounced the prayer of Saint Simeon the God-Receiver: "Lord, now lettest Thou Thy servant depart in peace, for mine eyes hath seen Thy salvation". Then again the Nun turned towards the elder and said: "Please, Abba, do thou fulfill for me yet another request. Go now to thy monastery, and in another year's time come to that dried-out streambed where we the first time spoke". "If only it were possible for me, – answered Abba Zosima, – to follow after thee constantly, so as to see thine holiness!" The Nun again besought the elder: "Pray, for the Lord's sake, pray for me and remember my woe". And having signed the Jordan with the Sign of the Cross, she as before went over the water and disappeared into the dark of the wilderness. The elder Zosima returned to the monastery in spiritual rejoicing and trembling, but in one thing he reproached himself, that he had not asked the name of the Nun. But he hoped the following year finally to learn also her name. A year passed, and Abba Zosima again set out into the wilderness. Praying, he reached the dried-out stream, on the Eastern side of which he saw the holy woman ascetic. She lay dead, with arms folded on her bosom, as is proper, and her face was facing the East. Abba Zosima washed with his tears her feet, not daring to touch the body, for a long while he wept over the deceased ascetic and began to sing the Psalms as are proper to grief over the death of the righteous, and reciting the funeral prayers. But he had misgivings, whether it should please the Nun, that he should bury her. Hardly had he but thought this, when he saw, that which was traced out near her head: "Abba Zosima, bury on this spot the body of humble Mary. Restore dust unto the dust. Pray the Lord for me, having reposed the month of April the first day, on the very night of the salvific sufferings of Christ, after the communing of the Divine Last Supper". Having read this inscription, Abba Zosima was astonished at first, who might have done this, since the ascetic herself was unlettered. But he was glad finally to learn her name. Abba Zosima realised, that the Nun Mary, having communed the Holy Mysteries at Jordan from his hand, instantaneously had made her distant wilderness journey, which he, Zosima, had taken twenty days to traverse, and immediately she had expired to the Lord. Glorifying God and having washed with his tears the earth and the body of the Nun Mary, Abba Zosima said to himself: "It is time already, Elder Zosima, to fulfill that commanded of thee. But how wilt thou be able, thou wretch, to dig out the grave, having nothing in thine hands?" Having said this, he saw not far off in the wilderness a cast-aside piece of wood, and he took it and began to dig. But the ground was very dry, and he could not much dig it, and drenched with sweat he could do no more. Having straightened up, Abba Zosima saw at the body of the Nun Mary an enormous lion, which licked at her feet. Terror seized the elder, but he signed himself with the Sign of the Cross, believing that he would remain unharmed through the prayers of the holy woman ascetic. Then the lion began to fondle up to the elder, and Abba Zosima, emboldened in spirit, commanded the lion to dig out the grave, so as to commit to earth the body of Saint Mary. At his words the lion with its paws dug out a pit, in which the body of the Nun was buried. Having fulfilled their bidding, each went their own way: the lion – into the wilderness, and Abba Zosima – to the monastery, blessing and praising Christ our God. Having arrived at the monastery, Abba Zosima related to the monks and the hegumen, what he had seen and heard from the Nun Mary. All were astonished, hearing about the grandeur of God, and with fear, faith and love they established it to make memory of the Nun Mary and to honour the day of her repose. Abba John, the hegumen of the monastery, at the words of the Nun Mary, and with the help of God corrected at the monastery the things that were needed. Abba Zosima, living all the yet more God-pleasing a life at the monastery and reaching nearly an hundred years of age, finished there his temporal life, and crossed over into life eternal. And thus there has come down to us this wondrous account about the life of the Nun Mary of Egypt, passed down through the ancient ascetics of the famed monastery of the holy All-Praiseworthy Forerunner and Baptist of the Lord John, situated at the Jordan. The account at first was not written down by them, but was reverently passed on by the holy elders from teachers to their students. "I however, – says Sainted Sophronios, Archbishop of Jerusalem (Comm. 11 March), the first transcriber of the Vita (Life), – that which I in turn received from the holy fathers, I have committed everything of it into the written account". "May God, working great miracles and bestowing great gifts on all, that turn themselves to Him in faith, may He reward also those honouring, and hearing, and transmitting to us this account and vouchsafe us a blessed portion together with Blessed Mary of Egypt and with all the Saints, pleasing unto God by their thought and works throughout all the ages. Let us give glory to God the King Eternal, that we be vouchsafed to find mercy on the Day of Judgement through Christ Jesus Our Lord, to Whom becometh all glory, honour, majesty and worship together with the Father, and the MostHoly and Life-Creating Spirit, now and ever and unto ages of ages, Amen".